Everywhere he looked he saw violence and injustice. He was powerless to change it. He was a singer-songwriter, a musician, a prophet, a student of his culture. He was deeply disturbed by the pervasive moral decay all around him. No one was able to stem the tide of violence and corruption. The wicked outnumbered the innocent. They intimidated the blameless, twisting the law, perverting justice. Ironically, these were God’s people who so flagrantly violated God’s laws. God replied, “Watch and see what I am about to do.” God would send a brutal, godless nation to conquer and deport them. These warriors were a proud people who worshipped the works of their own hands. They were a law to themselves, believing that their cruelty was justified; their might made brutality right. God answered him, assuring him that these brutal people, too, would be punished. The wicked, never satisfied with what they gained, would bring about their own downfall and death, their gains turning to ashes in their hands. But the righteous person trusts God and lives! God’s justice would prevail and his glory would cover the earth as the waters cover the sea. Twice Habakkuk asked God “why” and both times God answered with “who.” Habakkuk wrote down his questions and God’s answers in the first two chapters of the book by his name. Then, in the third chapter, Habakkuk modeled what trust in God looks like in a morally corrupt society, one ripe for punishment. Click here and here to read the first two chapters of Habakkuk. You can get print (PDF) and/or digital (MusicXML™) sheet music for The Song of Habakkuk I-IV. 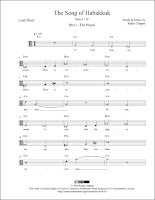 Click here for digital sheet music for orchestra.